I was working on getting a computer running, and just happened to glance at SPC’s 1 day outlook. It was around 12:30pm. SPC had a moderate risk area from about Lubbock, TX to McCook, NE. From the looks of things, they were expecting initiation along a dryline which extended along this line. A quick glance showed CAPE up to 2000 J/kg in the panhandle of TX. I called Bobby Edmonds and asked what his plan was, and he told me he was already in Dumas, TX. I threw my bags and cameras in the car, and gave the family a few minutes to get ready. By the time we were packed, gassed up and on the road, it was 1:15 or so. We took I-25 to Bernardo (Exit 175) and headed east on 60 to Clovis. We were mostly under overcast skies due to being behind the warm front, and couldn’t see much. I played around on 20 meters, and picked up a few new counties for me: Guadalupe, De Baca, Roosevelt, and Curry. 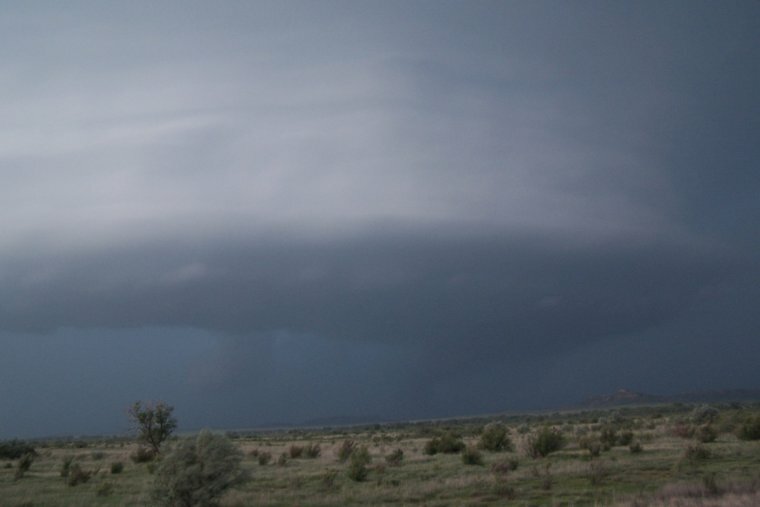 In Clovis, NM, I started getting text messages from Dad, saying that there was a strong line through most of the panhandle, and there were severe thunderstorm and TVS boxes between Amarillo and Lubbock. From 60, we could head northeast towards Amarillo, towards a cell with a TVS, or head southeast along 84 towards Lubbock. 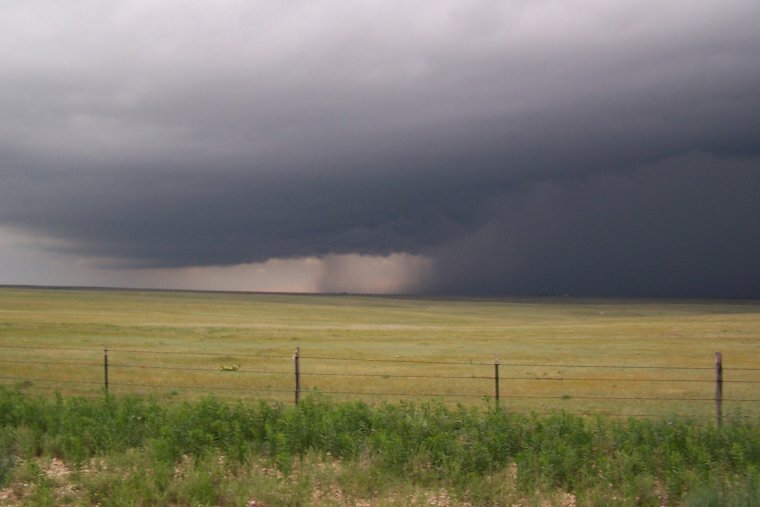 We went northeast to Hereford, and ended up heading towards Dimmitt, TX along 385. Because we were approaching the line from the west, we basically picked a hole in the line and shot through it. In Dimmitt, we refueled and headed east on 86 towards Tulia. 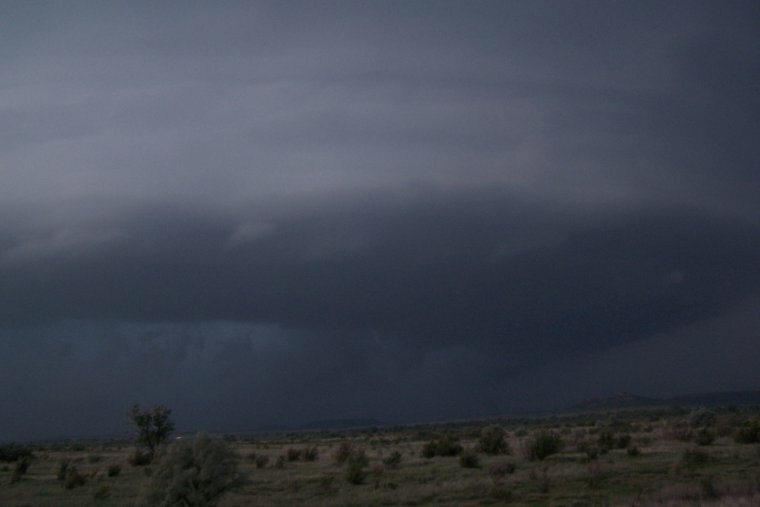 Daylight was escaping, so we were mostly watching the lowered cloud bases through the lightning as we headed towards a place to stay for the night. 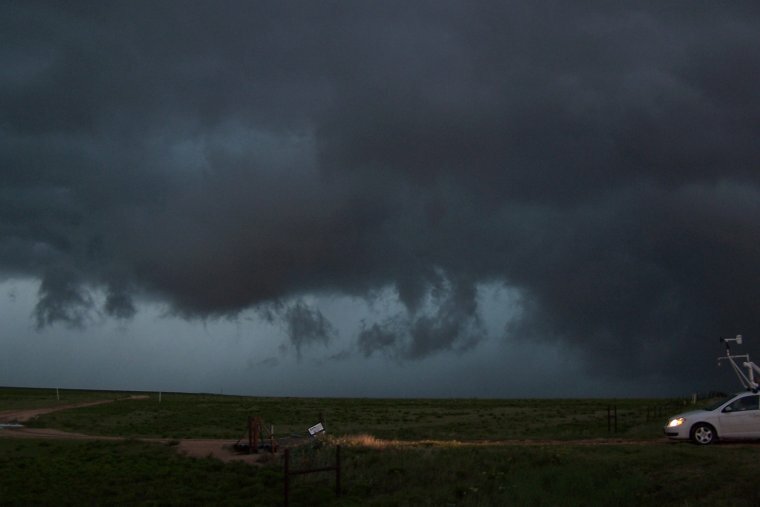 There was one wall cloud in the mess east of Nazareth, but seeing as it was relatively late at night, we could only see it when the lightning struck. We crept along 86, stopping as the precipitation picked up. 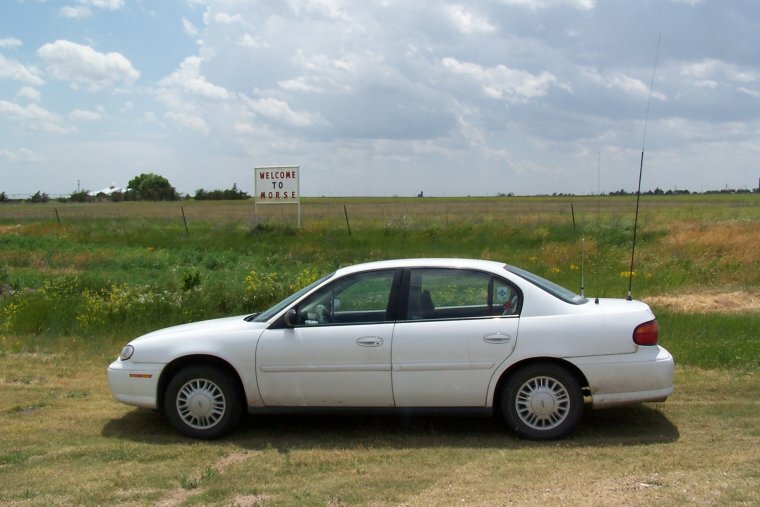 Once we found a hole in the line, we headed to Tulia. We stopped in Tulia at a truck stop west of town. Mostly, we were looking for a wireless signal, which we did not find. 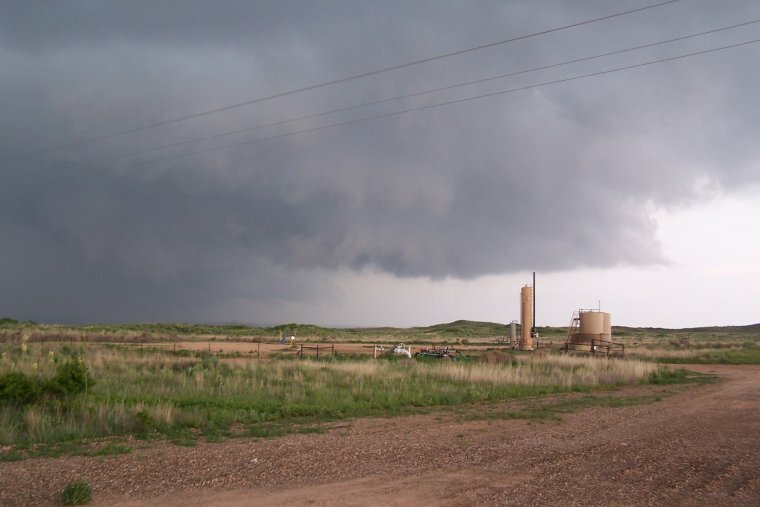 I did talk to a few kids from OU who had video of a tornado hitting Tulia a little earlier. I ran inside to check on the internet, and to phone home and ask them. I also got a call from Bobby who said that his WXWorx crapped out when the action started. I ran back outside and it had started hailing hard. It was only pea sized, but I wasn’t going to stand around and wait. We headed into the truck stop and watched it hail from inside. The OU crew had already headed north, as they intended to get back to Norman, OK that night. 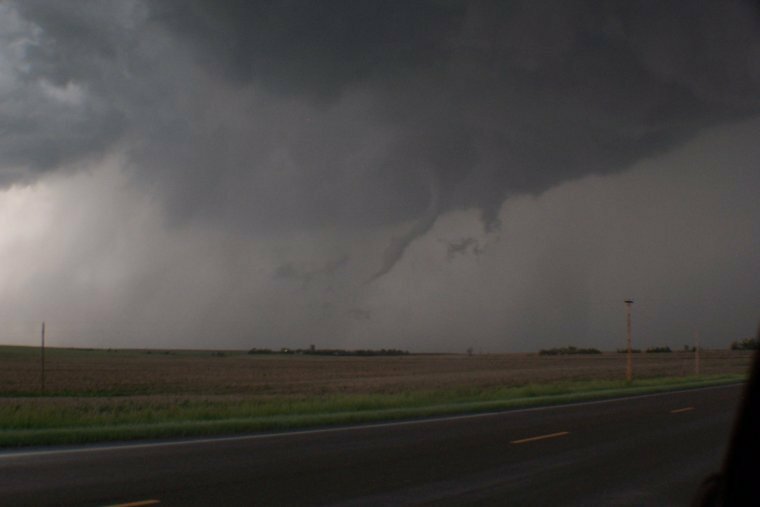 Bobby had missed all the tornadoes, but dodged large hail all day. He was hanging out at a Red Robin in Amarillo for now. We waited for the line to pass from the southwest. The truck stop was full of truckers and other travelers doing the same thing we were. After 15 or 20 minutes, the precipitation let up and we got back in the car and headed north up I-29 towards Amarillo. We spent the night in a Travellodge off I-40, off Paramount. Wireless internet, continental breakfast (which we slept through), and with tax and everything it was like $64. Not too bad for being in an urban area. Today, I checked the SPC website to see if there would be any more panhandle magic. No dice. There was only a slight risk in the Midwest covering IL, IA, MO, WI etc. We packed up, checked out a half hour late and hit up the Big Texan, despite the lack of tornado sightings. 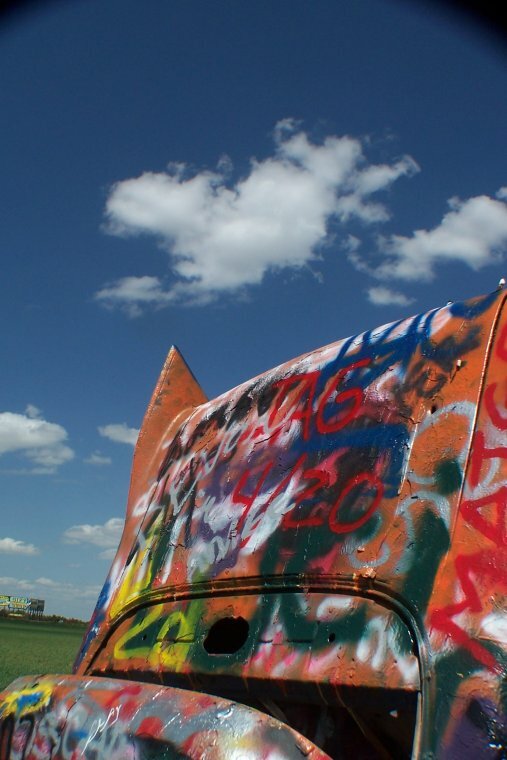 After a good steak, we headed out to the Cadillac Ranch. I took a few photos, spray-painted VT 4/16/07 on a driver’s side tire of one of the cars, and then continued west on I-40. Other stops included Tucumcari and Clines Corners. I picked up Potter, TX, and Quay, NM on 20 meters. As I write this, we are coming up on Albuquerque, and we will probably stop there for dinner. Gas-wise, we did well. I think we have filled up two-and-a-half times. We’ll probably stop for gas in Isleta, just because it is cheaper than anywhere else. 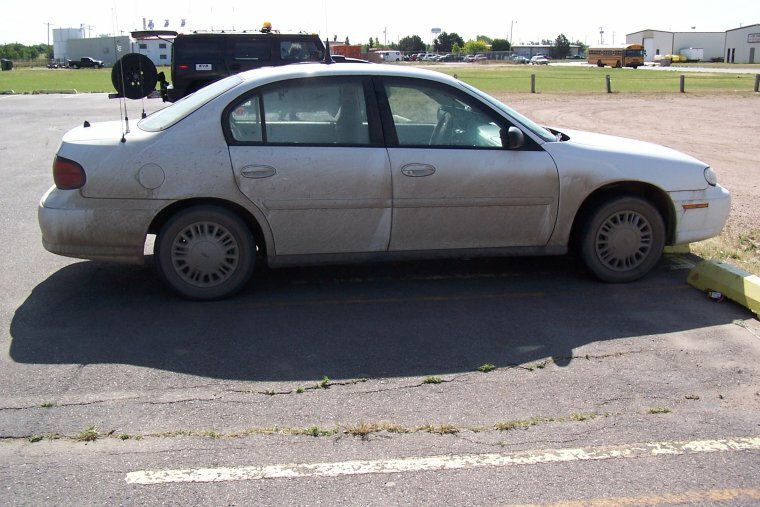 I think the first tank might have broke 30 mpg, which isn’t bad for Chevy’s least efficient car in 2002. Overall, for a first real chase with the family, I think it turned out well. 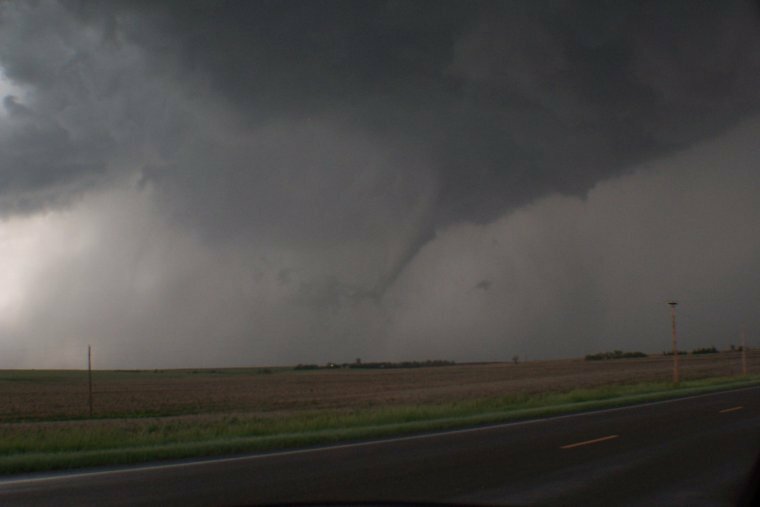 We were always in exceptionally safe places, we had a pretty good view of what was going on, even if we did not see the tornadoes, and I think everyone had fun. The little one was sad when we crossed back into New Mexico. Off to an early start this morning, left the hotel by 8am. No dice getting any reliable internet. I was able to receive wireless on the Pocket PC for a few minutes, long enough to fire an email to Dr. Hockensmith and reschedule our meeting. This morning has light cirrus clouds making for a bit of haziness. It is breezy and a little chilly, I will take measurements soon. 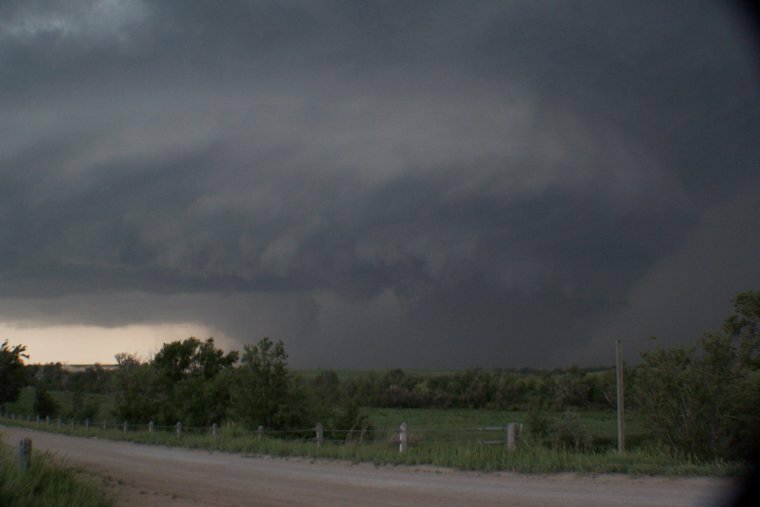 Dave Carroll hasn’t answered his phone, mom did not answer her phone, and Bobby Edmonds was asleep when I called him, though a brief chat with him said that SPC had a 2% tornado threat from around Liberal, KS to Lubbock, TX last night. I am writing from just outside of Stratford, TX. Another hour and a half takes me to Liberal. I hope mom calls back soon, I’ll get her to read me the SPC statement. A while later, the WX radio informs me that there is a ‘20% chance of showers, lower 80’s (temperature), breezy, some thunderstorms may be severe’ out of Guyman, OK. They also advise that a developing dryline at the TX/NM border, and upper level distrubances are expected to cross paths, with low level shear being best in the eastern panhandle (TX). Obviously, the best chance of tornadoes is east, and that weak midlevel winds will lead to slow moving storms. The dryline will be pushed past the panhandles quickly once the surface low deepens (probably tomorrow). 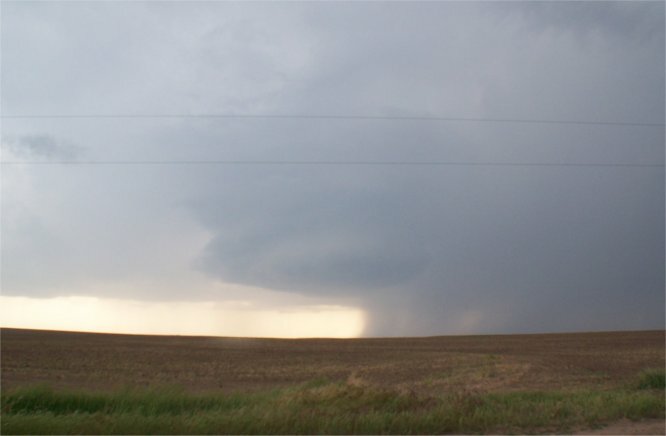 A Hazardous Weather Outlook (HWO) was issued for the following counties in TX and OK: Armostrong, Beaver, Carson, Cimiron, Dallam, Deaf Smith, Dayley, Berkley, Hansford, Hartley, Hirsel, Hutchinson, Lipscomb, Muller, Ogletree, Oldham, Potter, Randall, Roberts, Sherman, Texas, and Wheeler. 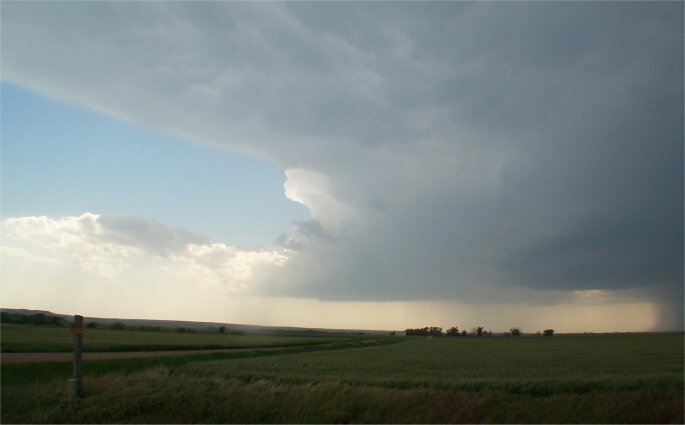 Large hail and damaging winds are the largest threat. According to Amanda, I might be ina good place. The tornado threat might be east of here. She says there is a developing low at the KS/CO border. If that forms, it might interact and bulge the dryline here. GFS and NAM both had that low farther north, which is why I aimed for KS/CO initially. Now that it is south, so am I. The only probably will be eastern routes, as it is likely to shift the dryline upon interaction. At 12:56pm CDT, light cirrus to the east, light cumulus to the west. Mom called and said tracking was spotty but had me in Gruver, TX. According to her analysis, this marks the 12hr position of the dryline. I left for Gruver, TX as I knew it would be a while before initiaion and N8KIE needed Hansford County, TX to have worked all TX, so I figured I would get it to him. All in all, 46 HF QSOs that day. At around 3, (I think), I took down the hamstick, as I was in no better position to give out new counties and I wanted to dedicate time to the chase. 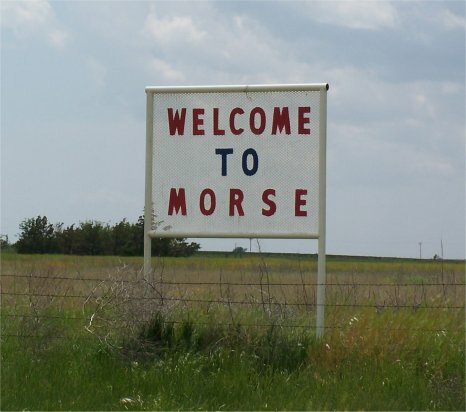 I left Gruver and headed to a small town called Morse for the sole purpose of taking a photo of the sign to send into QST. Cumulonimbus began to build a line. I knew it would squall out quickly, but I did not know how quickly. 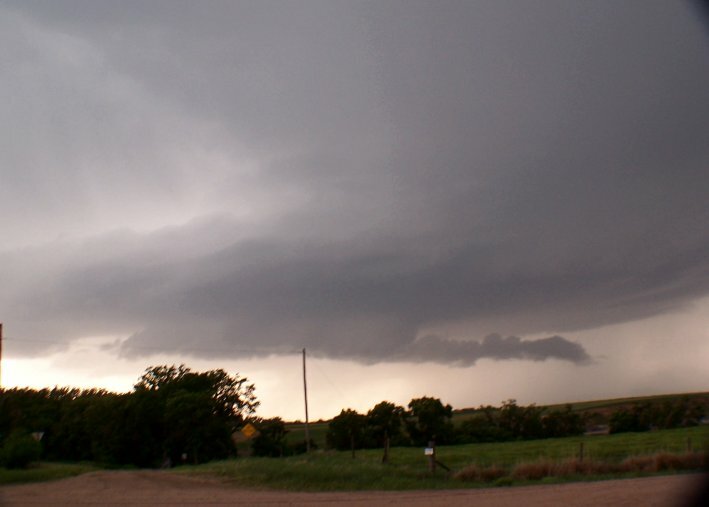 I headed up to Perryton and bounced between it and the OK border. I picked up wirelss at McDonalds (for $2.95/2 hours) and decided to head south, based on the radar. 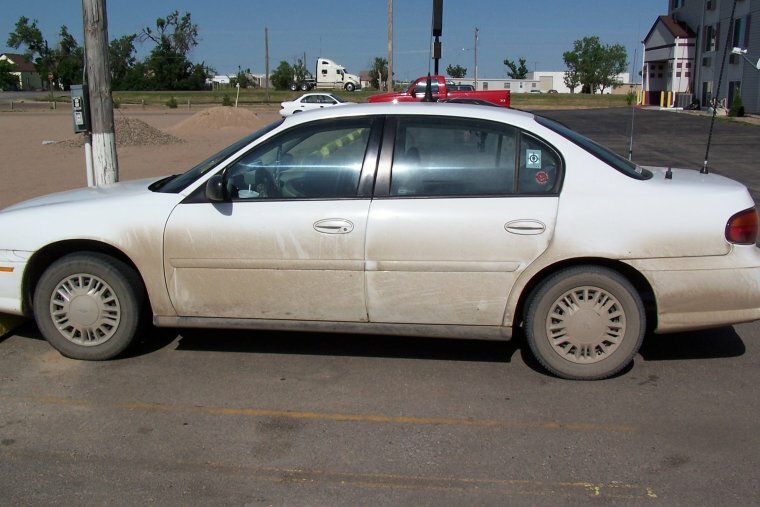 Somehow, I lost my storm chase magnet. Oh well, one stolen, one lost. It began to rain hard and then pea sized hail fell. 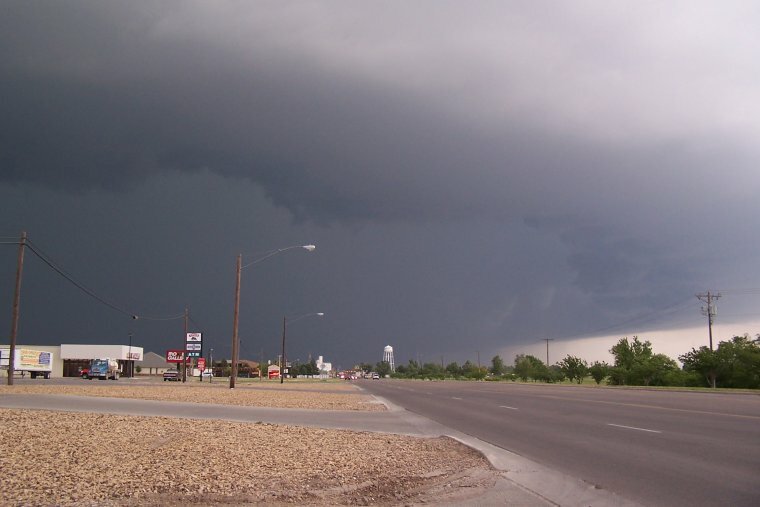 I pulled over at the Best Western at the south end of Perryton to avoid the hail. 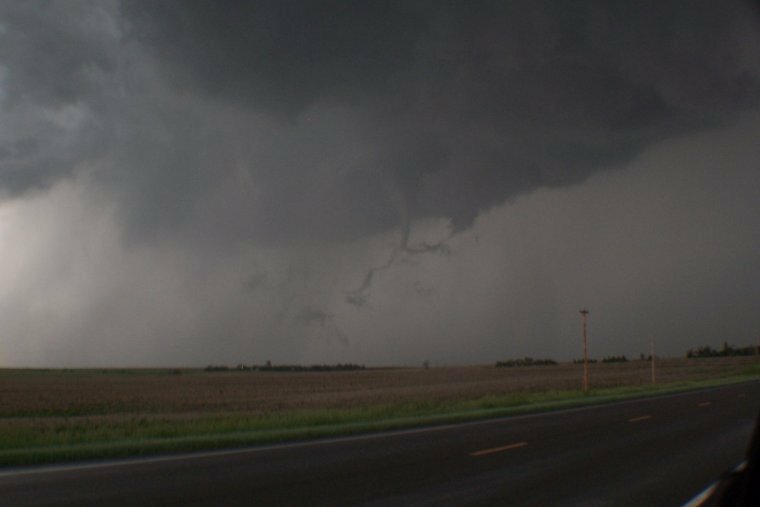 They had free wireless and the radar image showed that I could skirt south quickly and avoid the core of the storm, and might even beat a developing hook and be in position. Naturally, I headed south, beating most of the precipitation. Even though it looked to have a pennant, I figured it wouldn’t be rotating for long. 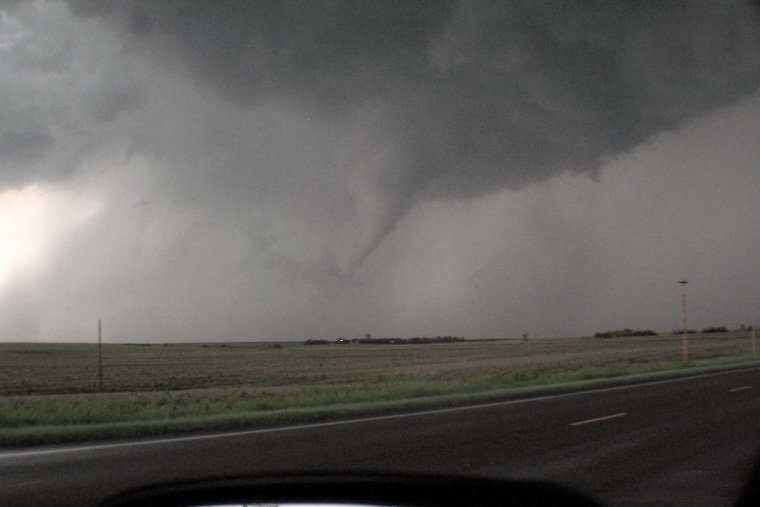 I passed a few chasers, both parked and headed north. I ended up in a spot between two squall lines such that I had heavy rain and impressive shelf clouds on both sides of the road. Night was approaching, so I continued south to Pampa. No vacancies. Then I headed through Miami to Canadian. No vacancies at either of those. I returned to Perryton to take the last room in Perryton at the Budget Inn (and was it ever). The Budget Inn had wireless in the parking lot near the lobby and a warm bed. That was about it. Exposed wiring, leaky roof, holes in the wall, ungrounded outlets, a toilet which was not bolted to the floor (I almost knocked it over as I grabbed it falling out of the shower). Anyway, it was only $44. A roast beef sandwich and I was on my way to Day 2. 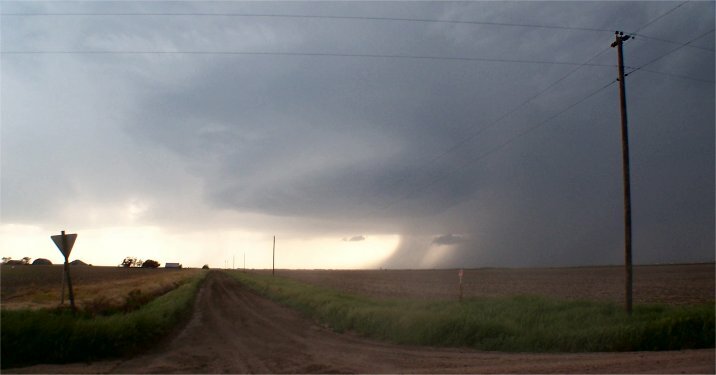 Today’s chase started in Perryton, TX. 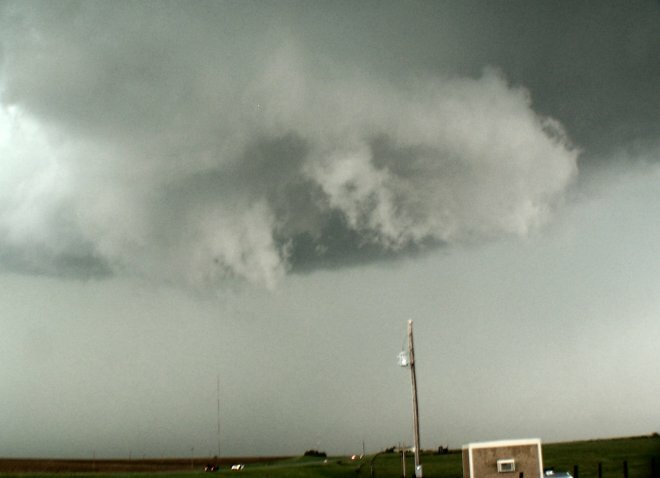 Having only limited data, (SPC for a few minutes) I could see that I needed to get to central KS. I picked Hays, partially because I knew I could get wireless there and partially because I knew Dave might be there. 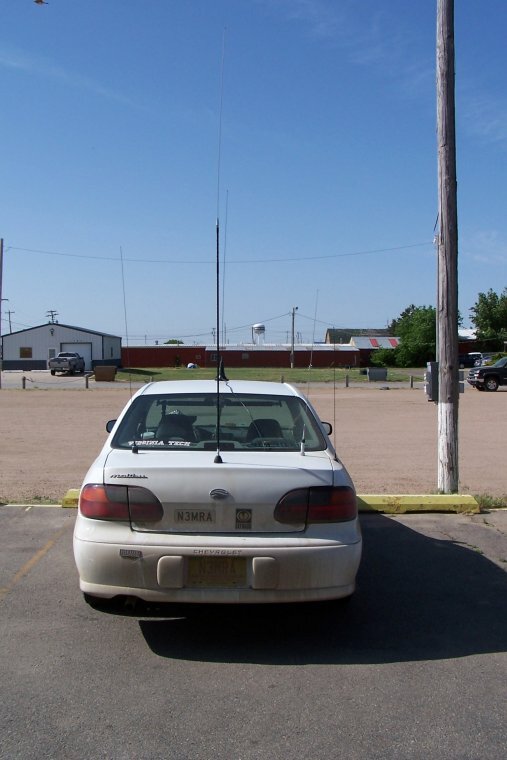 His tracker has not been working, and it still showed him in O’Neil, NE. I left Perryton, went through Liberal, bypassed Dodge City and arrived in Hays. No sign of Dave, and so I headed up to Wakeeny as Bobby was there at a BP. Wakeeny has at least two exits, and I pulled off at the wrong one- but who should I see? Dave and the VT/Pulaski crew filling up. I chatted with them, filled the tank and we all drove across to Super 8 to use their wireless. They have four active chase days. A few of the guys were throwing a frisbee around until it was carried by the wind onto the roof of the hotel. Eventually, it worked its way down to the edge of the roof, and the next gust blasted it over the hotel completely into the back of the lot. I rode up to the other exit and met up with Bobby. He had drive down from SD, just a Dave’s group had. A small chaser convergence began to form. Then for no reason at all, I locked my keys in the car. It was so dumb, and I’ve never done that before. A phone call to the local police and an officer was able to unlock my car in a few seconds. Chuck Doswell told me this sort of thing happens all the time. I went back to check on Dave’s group. Then a tornado watch was issued for our area until 11:00 pm. Bobby came over to out exit, introduction were made and all eyes turned to the sky. A few cells began to pop up- a few began to break the cap. Bobby and I both jumped on a strong cell to the southwest. 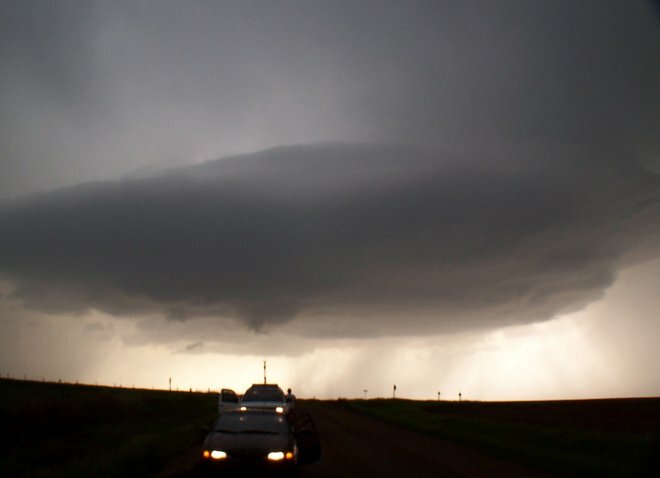 We ended up going down a bunch of dirt roads and intercepted several rotating wall clouds. We were originally south of I-70, but ended up crossing over it and being north of it for the rest of the chase. 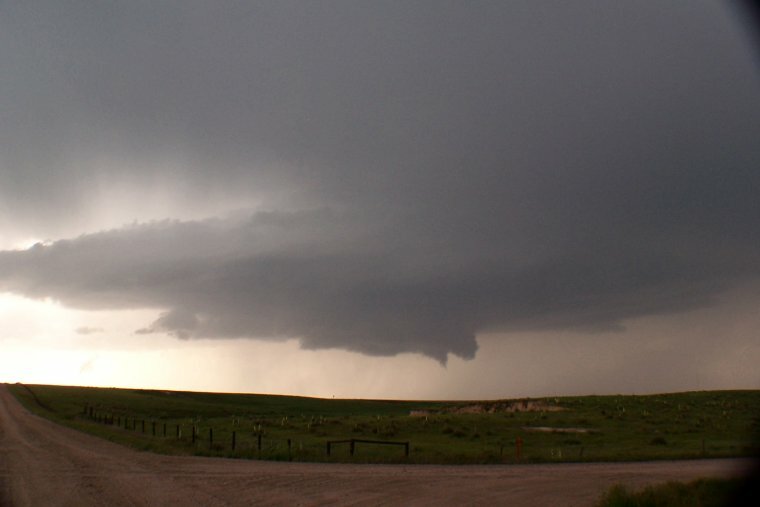 At one point just west of Wakeeney, we are watching a lowering, but the contrast is bad. 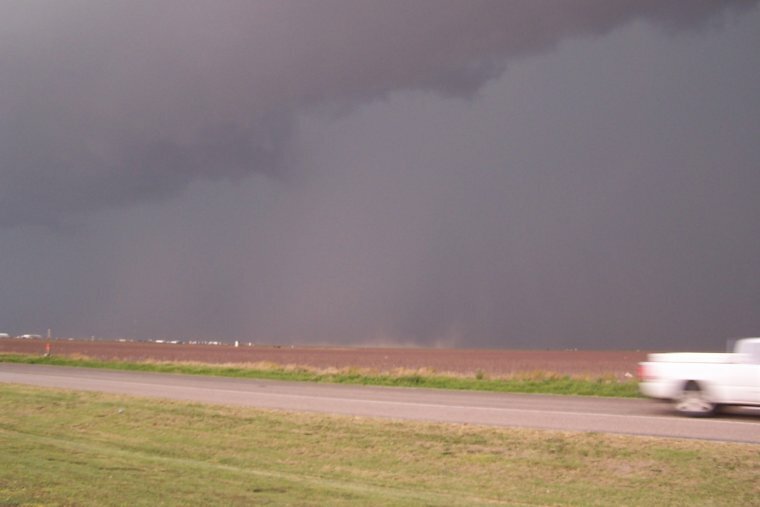 We decide to head north along US-183, we are watching a lowering, but the contrast is bad. 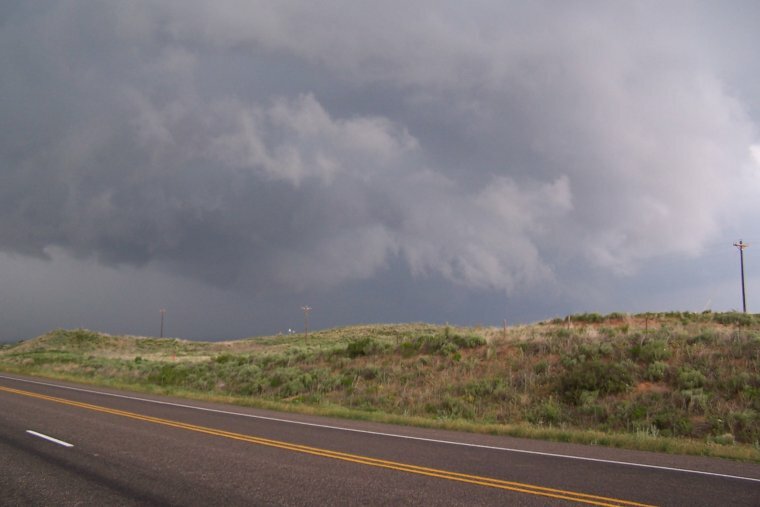 We decide to head north along US-183 when the storm drops a tornado. I fumble around with both cameras and the steering wheel and manage to snap a few photos. I’m sure I have some shaky video as well. I stop to take a few more photos as the tornado ropes out and disappears. Bobby is somewhere along the road- I passed him and didn’t realize it. 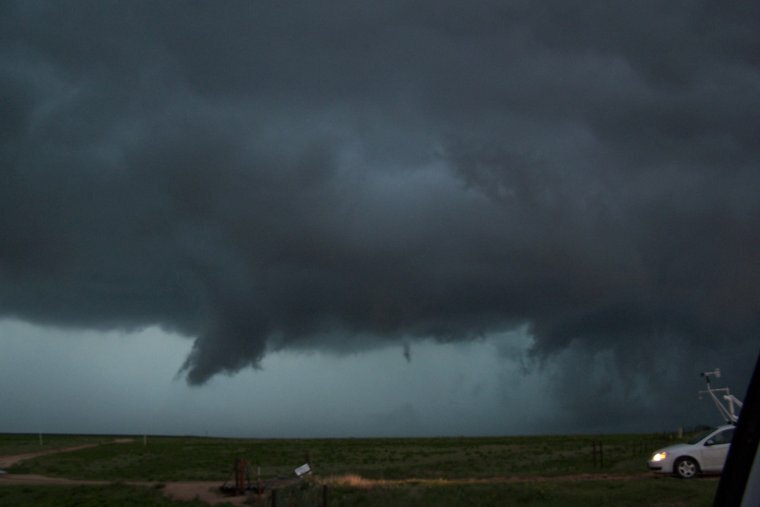 We catch up and follow the wall cloud east for a bit. 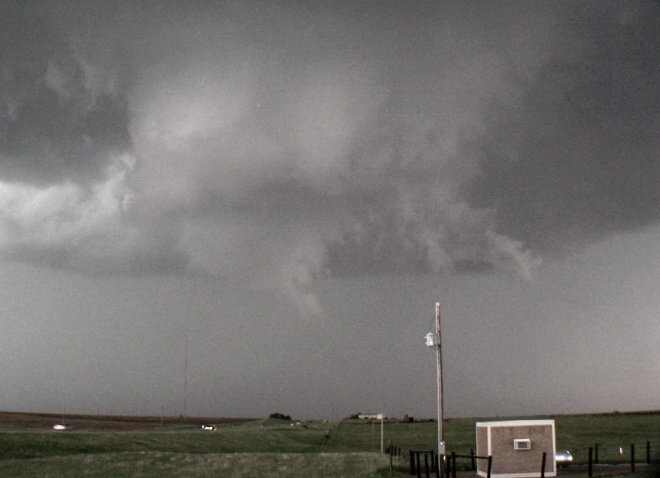 It is still rotating heavily and has produced another funnel cloud, but does not tornado again while I’m on it. The daylight hours are escaping and the storms are beginning to form a line. We decide it would be good to beat the other chasers to a hotel. However, developing storms in the flanking line cut us off from Wakeeny. We end up heading for southwest to Garden City. We ate at Wendy’s in Scott City then down to Garden City Super 8 for the night. Internet and a decent stay for like $62. A nice lunch at Applebee’s, and we were back on the road to Perryton, TX. We arrived at a McDonalds with wireless internet, and got data there. The weather radio kept saying thunderstorm development would be east of ‘U south’, so when I had internet, I found that the meant U.S. Route (whatever), but the automated message treated S. as south. Soon, there was a tornado watch box, and we were in the right place. I worked on the car a bit, fueled up and waited. Bobby did the same. Eventually, we saw a cumulus field developing farther south, so we headed south again. 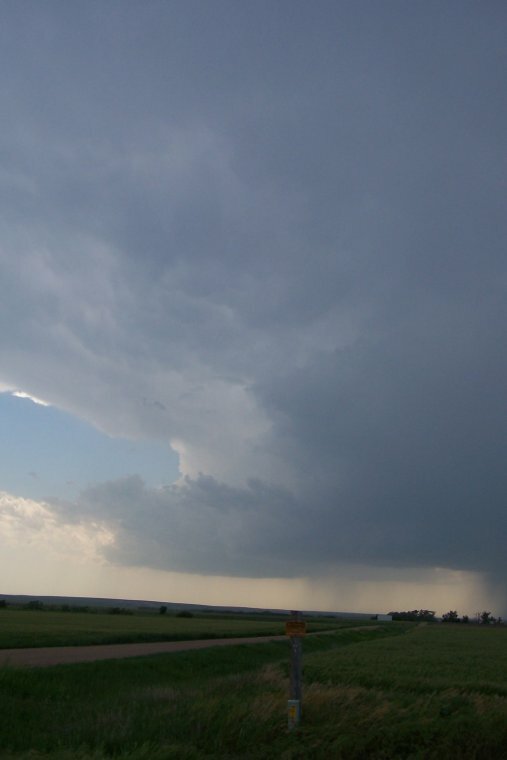 Driving down some back roads, we ended up on the southeast side of a few nice cells. 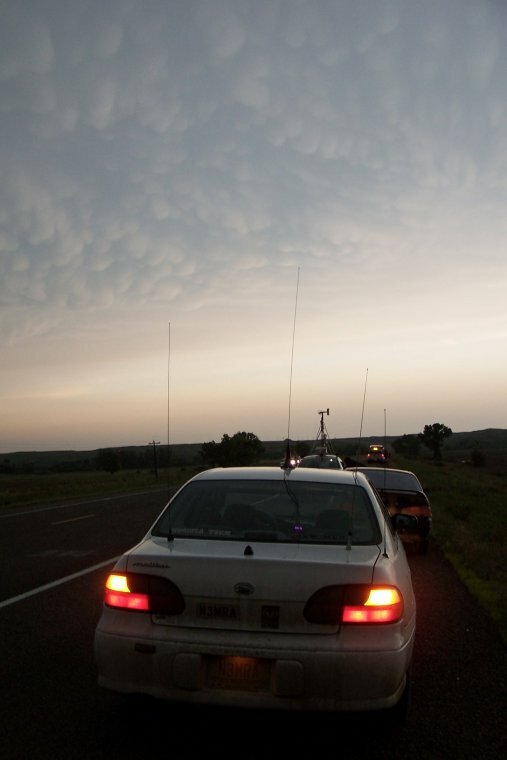 Sunset was approaching, the road network was not very good, and the potential for chaseable storms was diminishing. We decided to call it a day and head south for a hotel. 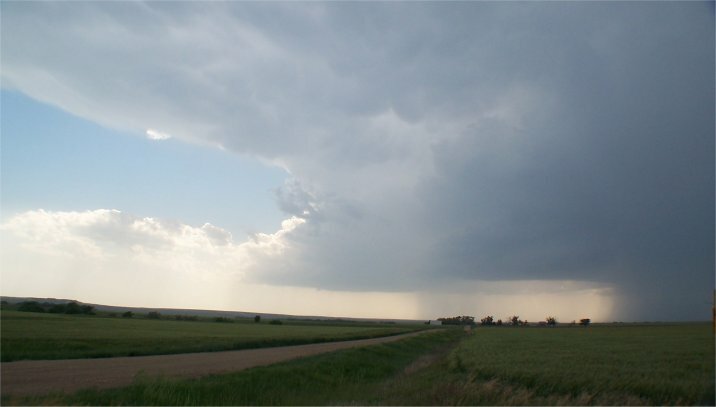 Along the way, Bobby’s WXWorx indicated a discrete cell southwest of where we were. 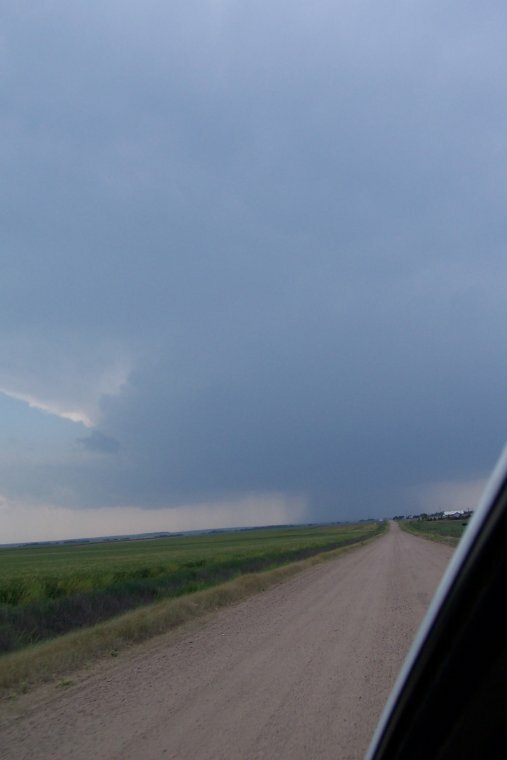 It had a well defined hook echo, and so we headed towards it down a dirt road. About a mile down the dirt road, there was a spot in the road that had flooded, so we were forced to turn around. A few people tried to cross, and I know of at least one car that stalled out. Don’t ever cross running water, it’s dumb. 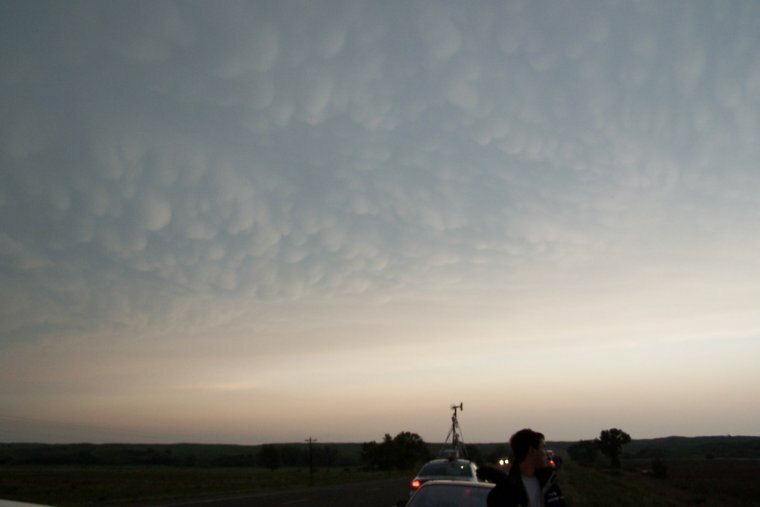 We never saw a tornado on this cell, but it had some amazing mammatus in front of it. 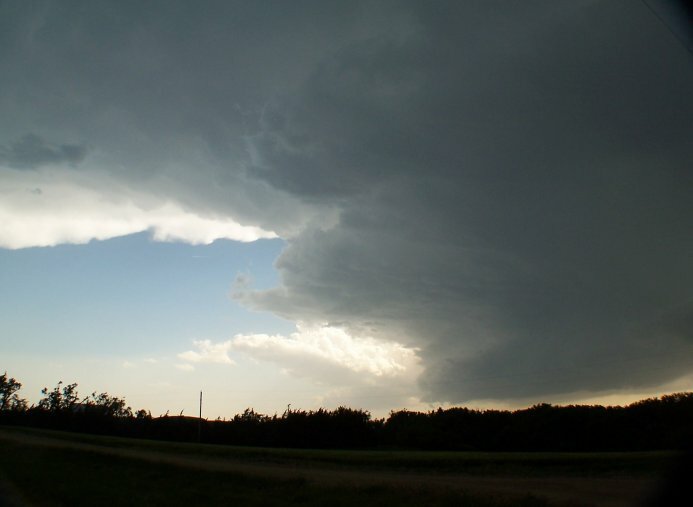 Here are a few photos of the cell and the mammatus. The sun had set, both for the day, and on the chase season for Bobby, and maybe me. 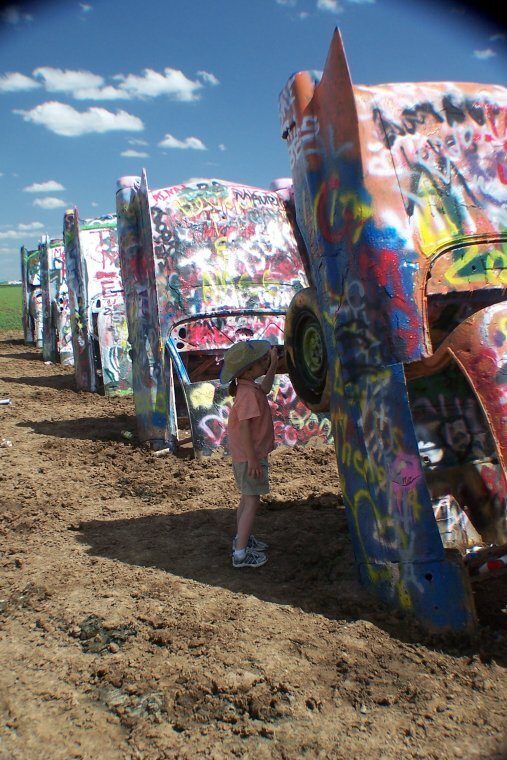 We spent the night in Amarillo, and headed west the next day.